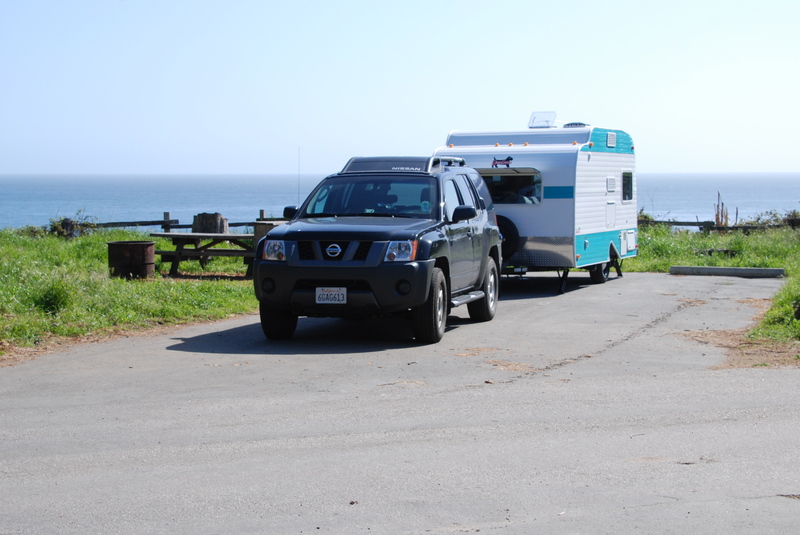 Trailer in tow, we pull up to the ranger’s hut without a reservation and are assigned a campsite with a million dollar view: the wide blue horizon of Monterey Bay. An auspicious beginning for our first trailer trip. In preparation for this day, we’ve spent hours darting back and forth between house and trailer; assembling, packing, testing and arranging our shelter on wheels, plagued (speaking for myself) with start-up angst over what will be necessary, what will be desired, and what will fit. Since space is at a premium, we’ve limited personal effects to the bare essentials: quality wine glasses with stems, a selection of poetry by Oliver, Frost, Kunitz and Yeats, Grandma Suzy’s guide to Pacific Coast Wildflowers, and Sibley’s Guide to Birds. Our first meal cooked on the two-burner gas stovetop will be curried lentil, kale and sausage soup. I put the pot on to warm, and as soon as steam escapes from under the lid, the smoke alarm goes berserk, emitting a series of high-pitched shrieks. Basil barks to let us know something is wrong, as if we didn’t know. Dave flings open the trailer door and I fan a potholder under the sensor. It goes silent for about three seconds before blasting another round of ear-stunning screeches. Dave yanks out the battery and disables the thing, muttering that if something catches on fire, we’ll surely know. After dinner, we walk the dog and then sit by the campfire. An experienced camper, my capable husband is dressed appropriately for the outdoors, but due to oversight or inexperience I am wearing little more than yoga gear. (Sleeveless cotton shirt and Capri leggings? What was I thinking?) Basil too, is shivering. He sits on the ground next to my chair, his dark brown eyes imploring me to stop this nonsense and go home where it’s warm. I pull him into my lap and huddle closer to the flames. For a dog who lives in the present and divides the world into two categories—threatening and non-threatening—the line between novelty and apprehension is razor thin, and this strange new activity represents a frightening departure from the norm. For me too, but being human, I understand that camping, by definition, is uncomfortable. That discomfort is part of the reason we do it; to remove ourselves from the familiar, to form new neuronal connections, to seek inspiration, and to come back renewed. Or so I keep telling myself. The night is cold, and we sleep fitfully on a mattress that spares no mercy for hips and shoulders. In the morning, my neck aches. A cold film of condensation coats the windows. The water view has dissolved into gray mist, and a faint tapping on the trailer top turns to steady rain. The good news is that we have spent the night at a campground a mere two miles from home. After breakfast, we return to the house for the things we’ve forgotten (raingear and winter clothes, for me) and then head for Target for a few last items on our list. 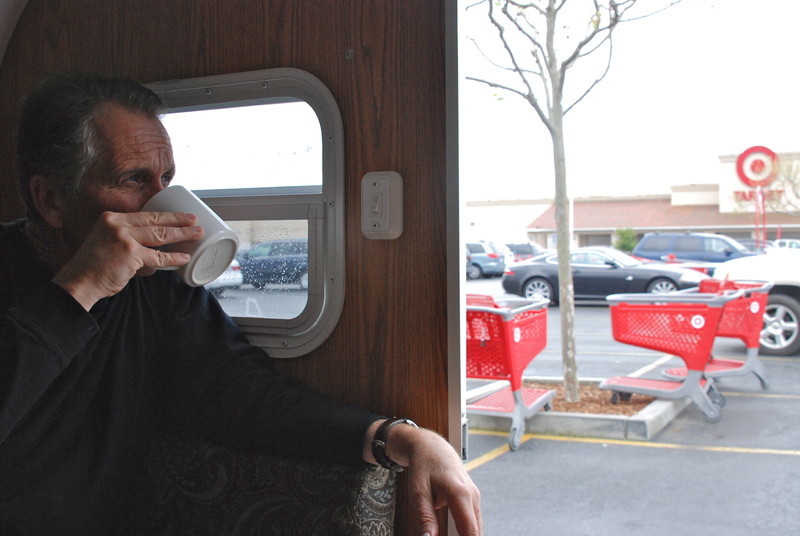 Shopping takes longer than we’d planned, and when we’re done it’s lunchtime, so without further ado we repair to the trailer for sandwiches and cappuchino. Right there on the blacktop overlooking parked cars and bright red shopping carts. Convenient, inexpensive and delicious. I’m liking our snug little trailer more every minute. On the road for real, we roll through hilly grasslands dotted with oak trees and livestock, blue skies overhead. 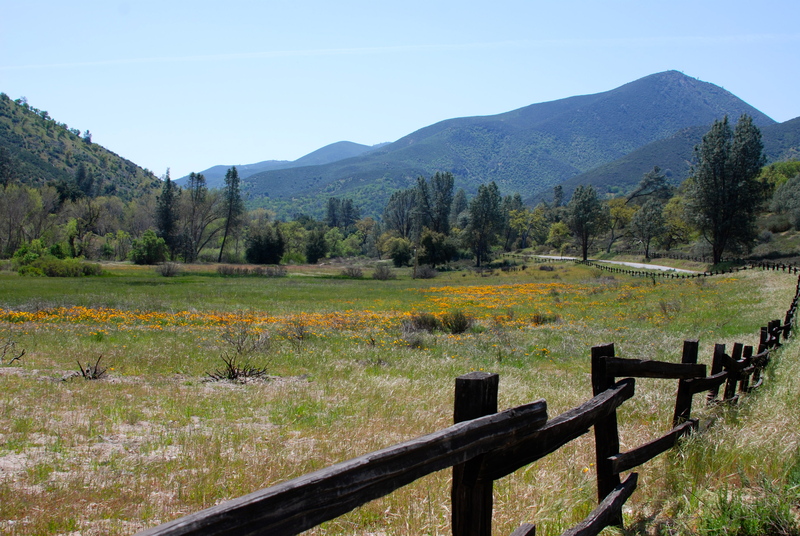 We keep a sharp lookout for patches of color signifying wildflowers, and are rewarded with an underwhelming display. No matter, the drive is easy, the landscape green (this time of year, anyway), and the trailer bumps sweetly behind us. 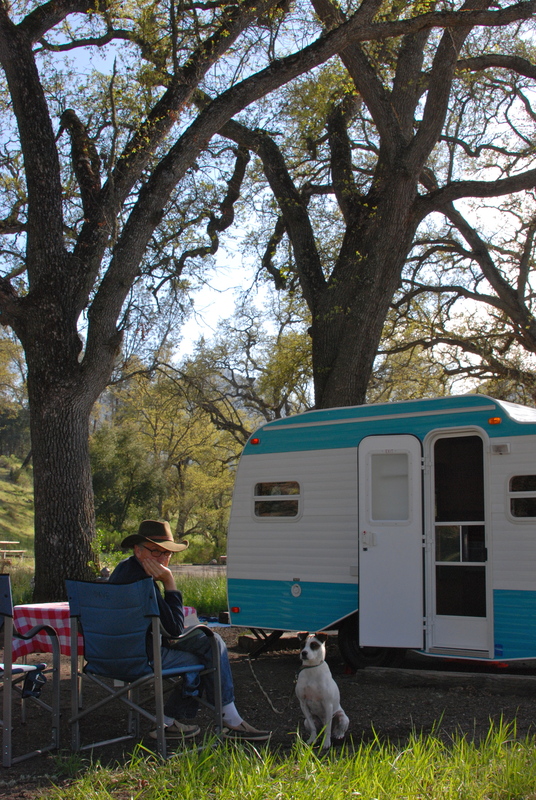 At the Pinnacles campground, we find our designated site at the edge of a large field. I am charmed by our expansive view of green valley and jagged hills, by the sound of quail yodeling in the undergrowth, and by fact that we can plug into an electrical outlet. True enough, the campsites near us are occupied by large motor homes, and our site is far from tree or bush. But there’s no better site available this night, so we park the trailer and set up camp in the meadow. I spread a red and white checked cloth over our table and unfold two chairs. Basil, nose twitching, velvet ears attentive, roams the campsite as far as his tether allows. Quail forage in the grass not five feet in front of us. In the distance, Condors circle rocky peaks. We sit, enjoying the view, the quiet, and the feeling of having arrived. 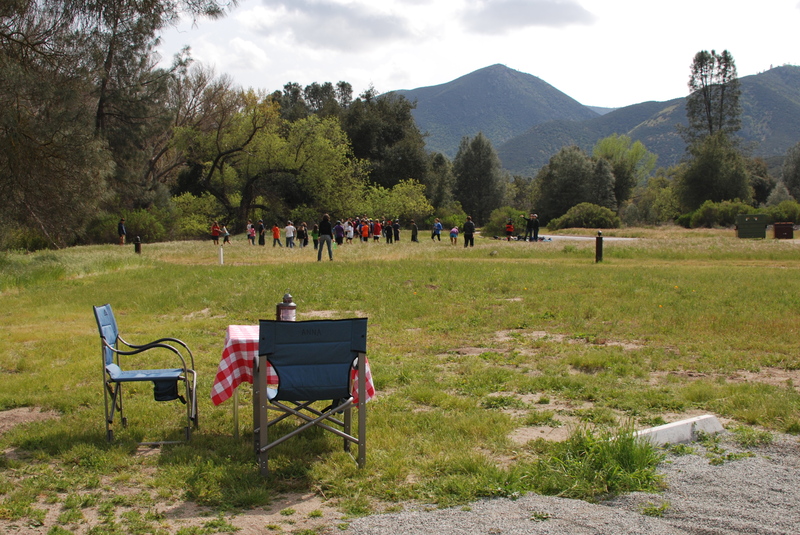 Without warning, a horde of kids spills into the meadow, wave after wave of adolescent campers followed by a handful of young adults. They divide into teams and begin playing a series of games that require much shouting and running around. So much for peace and quiet. I don’t mind. The place is still beautiful. And it’s all part of the adventure. Dusk approaches, and the junior campers file out of the meadow. I unroll my yoga mat on a flat patch of ground and Dave takes Basil for a walk. A cool breeze combs the grass. I worry I will feel awkward and distracted practicing yoga out of doors in plain sight of anyone who happens to be looking. But the opposite is true. The fresh air seems to magnify each sensation, and I don’t care if anyone is watching. Each muscular contraction and release, each inhalation, each exhalation, feels more invigorating than the last. When I return to the trailer, dinner is almost ready: sautéed fingerling potatoes and sausage accompanied by a salad of red-leaf lettuce, chopped carrots and balsamic vinaigrette. The wind has strengthened and chilled, so we dine inside. We pour boxed Malbec into stemmed wine glasses and use our amber table light for the first time. It casts a warm glow. In the morning, Dave and Basil explore the labyrinth of tent campsites and report a large selection of tree-shaded spaces available. No hook-ups, but we are willing to relinquish electricity for ambiance, so we embark on a quest for a more gemütlich spot. At each potential site we consider the aesthetic appeal and the je ne sais quoi of gut feeling, then weigh practical concerns such as proximity to neighbors and restrooms, amount of level parking, shade versus sun and site orientation. “Camp site selection,” Dave declares, “is both art and science.” We narrow our selection, review our options, and decide on a secluded clearing shaded by four giant valley oaks. After establishing our new campsite, Dave and I fortify ourselves with a snack of Gala apples and almond butter on whole grain bread and depart for a hike to the Pinnacles Overlook. Basil must wait for us in the car, windows cracked wide, as dogs are not allowed on any of the trails. We climb for an hour on a sun-baked trail. Early on, we shed coats and stash them behind a rock, and Dave rolls up his jeans as if digging for clams. We continue past Manzanita bushes, flowering Indian Paintbrush and boulders daubed with rust and mustard-colored lichen. In a few places, oily poison oak leaves stray across the trail. I keep watch for snakes, and sight a tail-tip sliding off the path into tall grass. At the overlook, Dave composes a few pictures, but overall finds the lighting and scenery less than inspiring. Basil is happy to see us return. The temperature inside the car is warm but not hot, and I am relieved to see he shows no signs of distress. Any later in the day, or in the season, we wouldn’t dare leave him there. The rest of afternoon we relax under the lattice of tree limbs shading our site. A colony of Acorn woodpeckers inhabit the trunks and branches surrounding our camp. I like the tapping noises they make, and Basil doesn’t seem to mind, even though it sounds like someone is knocking at the door, usually a hot button for him. In the early evening, deer graze on the hillside. Basil barks at them, but stops when we tell him to. Dave builds a bonfire and we set the table for dinner outside. Anna’s goulash, wide egg noodles, green salad, baguette and Emmentaler. Still working on that box of Malbec. Just before nightfall, we take Basil on a long walk around the campground. He sniffs incessantly. A wild rabbit feeds in a clearing. Basil spots it. The hair rises along his back and he strains at the leash. White cottontail disappears into the undergrowth. Early the next morning we head for home, shakedown mission accomplished. We’ve practiced setting up and breaking down camp three times in three days. We’ve figured out the best system for washing dishes and where to put clothes. We’ve determined that the seldom-used microwave makes a good breadbox, and that we need a layer of foam under the mattress. We’ve started a “to do” list for our next trip. 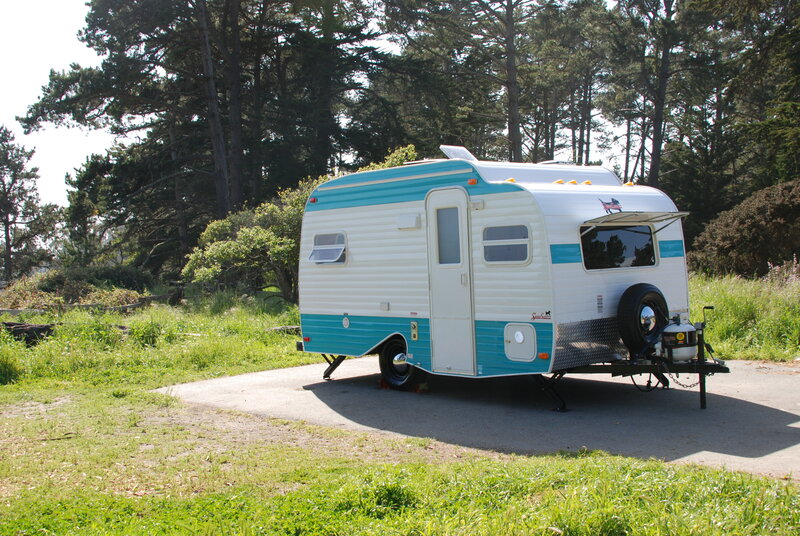 Best of all, I’ve discovered I like trailer camping more than I feared I wouldn’t. Back in Capitola, Dave and I unpack and wash down the trailer while Basil curls up on the couch and takes a five-hour nap.